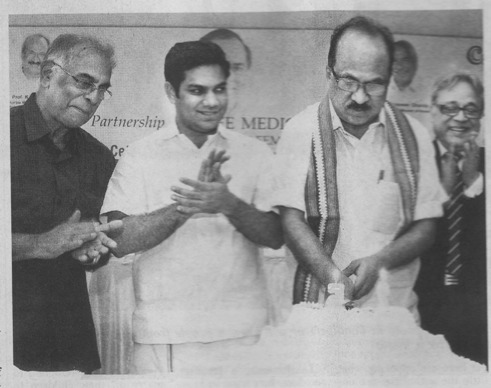 Prof. K.V.Thomas, Union Minister for Consumer Affairs cutting a cake to commemorate the 25th anniversary of the Consumer Protection Act. A national policy to protect the interests of consumers is on the anvil. This apart, the existing Consumer Protection Act would be amended so that consumer disputes' redressal forums become more effective in enforcing their orders and the consumers get commensurate compensation, said Prof. K.V.Thomas, Union Minister for Consumer Affairs, Food and Public Distribution, while delivering his valedictory address of the Silver Jubilee celebrations of the enactment of the Consumer Protection Act, organised at the IMA House, Kochi, on 24th Dec. 2011, by the Partnership for Safe Medicines (PSM) India and the Indian Medical Association (IMA). The Parliamentary Standing Committee is looking into the amendments to the Act. Prof. K.V.Thomas expressed concern at spurious and often over-priced drugs flooding the market. "Many doctors prescribe drugs as suggested by pharmacy companies. These doctors fall prey to the lure of gifts, cars, apartments and foreign trips promised by these companies. Often, they prescribe drugs for a month, whereas medication for a week would have been enough." In his address, the founder of the PSM India, Sri Bejon Misra, said that awareness of the consumer rights played a major role in ending the monopoly of a few firms in many sectors. He called for safeguarding the interests of consumers and to make safe and quality medicines must be made accessible to all. The past national president of the IMA, Dr. P.V.George said that spurious and substandard drugs are a menace. He felt that the attitude of the patients must change since many of them are not content if the doctor prescribes simple medicines. Since courts function on the basis of evidence, doctors are often forced to practice defensive medicine, he said. Earlier, speaking in the Technical Session, Sri B.Vaidyanathan, Chief Mentor, Consumer Protection Council, Rourkela, highlighted various amendments sought to be introduced in the Consumer Protection Act, 1986. He felt that the proposed amendments were quite progressive and had the potential to revive the consumer movement. Especially, the provisions relating to: award of interest on the compensation for the period of delay in the dissolution of the dispute; to pay a fine of Rs. 500 per day for delay in complying with the order of the Forum; inclusion of Unfair Contracts and enlarging the scope of Unfair Trade Practices to make non issue of cash memo and making it obligatory on the part of the seller to take back goods sold within 30 days; should help the affected consumers to assert themselves. He cautioned that all the benefits envisaged in the Act can have the desired effect only when appropriate enabling provisions are made in the Consumer Protection Rules. For example, while the proposed amendment has ambitiously enhanced the penalty payable by the provider of defective goods or services from 5% to 25%, when such defective goods or deficient services affect a large number of consumers, the impact of such provisions will be felt only when the complainant is given adequate portion of the award, he said. The others who spoke include S/Sri Hibi Eden, MLA, Manoj Parida, Jt. Secretary, in the Ministry of Consumer Affairs, P.B.N.Prasad, Dy. Drugs Controller, and Ranga Iyer, Advisor, India Health Progress.